"Modern Australian architectural variety": Berkeley River Lodge. If there was ever a place to completely escape, the Berkeley River Lodge is it. Want to confuse Google Maps? Ask it for directions between the small town of Kununurra and Berkeley River Lodge on the north-east Kimberley coast. It can’t be done. This is because the only way in and out of the singular lodge, perched at the mouth of the Berkeley River as it meets the Timor Sea, is by float plane. Beyond this there are no roads; no boat routes. This is way out back of the outback; a tiny, shiny dot in this wide brown land. Berkeley River indulgence – one wilderness lodge worth splashing out on. Getting there, then, is part of the fun. Certainly, the one-hour flight between Kununurra and the lodge is an experience in itself. There is a particular romance about sea planes, which isn’t dispelled by the small aircraft (four-seaters and eight-seaters are used) as it taxis along the Lily Creek Lagoon and then soars up over the local sandalwood plantations on its way north. The trip takes you over vast cattle stations where, according to the pilot, they lose at least one cow a day to crocs, and then across the great variegated flats of the Berkeley River delta, up to and along the coast to where the lodge sits high up on large dunes; the river on one side, the sea on the other. 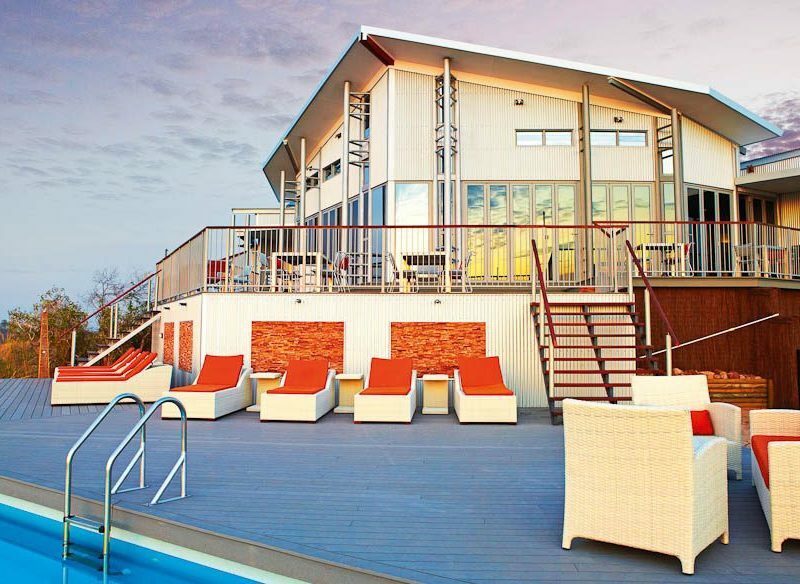 Outback chic on the balcony: Berkeley River Lodge. Here, you are met on the golden soft sands by a staff member with cold drinks and a buggy for the short ride around the beach and up into the lodge proper. On the way our driver points out a turtle nest that had been ravaged by dingoes; the little dried-up, empty shells a timely reminder that we’re in true wilderness, with nature red in tooth and claw. Like many other wilderness lodges, the accommodation is what you might call ‘outback chic’. Branching out from the large main lodge (20-metre pool, restaurant/breakfast area and reception) the 20 bright white, standalone cabins spread away in three arms along the top of the dunes. Your own private al fresco wet room, Berkeley River Lodge. They are of that modern Australian architectural variety that includes corrugated iron cladding, steel poles, glass doors and steeply pitched roofs to create light and space. 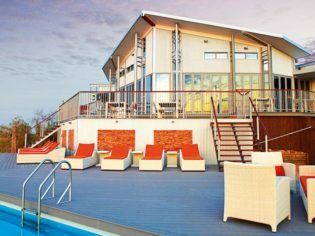 Every cabin has its own deck with wide vistas looking out on to the ocean or the countryside back towards the river and the lonely pimple of Mount Casuarina. Inside, they are simply but beautifully appointed with air-con, luxurious bedding, the obligatory Nespresso machine and plush furniture, with a private al fresco wet area – a little oasis that’s perfect for outdoor showers or a soak in a bath under the stars. Beautifully appointed rooms on the dunes – Berkeley River Lodge. The food in Dunes Restaurant in the main lodge is sophisticated and delicious, the service professional and relaxed, with nothing too much trouble. Highlights for me included the one-day cruise along the peaceful Berkeley River system, which took in short bushwalks to secluded waterholes, visits to stunning waterfalls and enough flora and fauna to capture everyone’s interest. The lodge also puts on fishing expeditions, guided hikes, stargazing nights and 4WD tours. Do take advantage of the sunset drinks on the beach if they’re available. It’s not cheap though – a three-night package starts at $3990 per person, which includes the one-hour return floatplane transfer – but how do you put a price on this once-in-a-lifetime experience? The verdict: An outback lodge that strikes the perfect balance between simple luxury and wilderness. The people, food and amenities are all top-notch. We rated: Splashing about in the refreshing waterholes on the river cruise. We hated: The 10-kilogram luggage limit per person, due to floatplane requirements. Each guest receives a free travel bag specially designed for the luggage compartment. Excess baggage can be stored in Kununurra. Notes: Three-night packages start from $3990 per person, twin-share including all meals and beverages, sea-plane transfers and a range of activities.